The photo was taken in 1848 in St. Petersburg after the family left Votkinsk. This is the only childhood photo of Pyotr Tchaikovsky. The most expensive museum relic – antique straight stringed grand piano, the keys of which were touched by the little fingers of Peter. 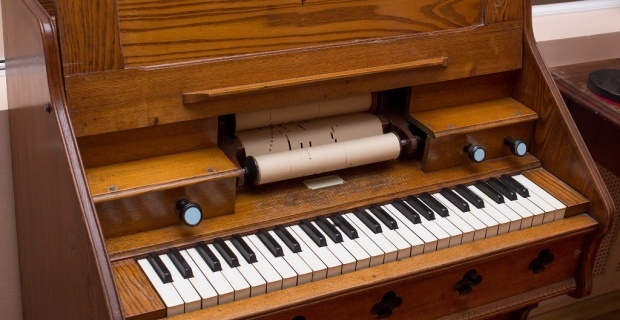 Orchestrina is a mechanical organ. 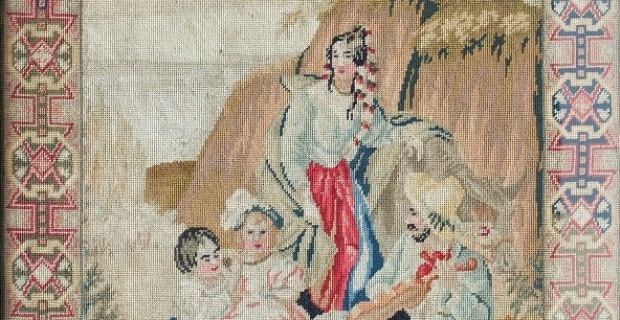 The sounds of an orchestrina were the first strong musical impression of the young Peter. The screen was embroidered by Alexandra Andreevna Tchaikovsky as a gift to the spouse in the year of birth of son Peter (1840). The several memorial lidens remained in the garden, which "remember" the family of Tchaikovsky. The oldest of these, about 237 years. In 1837 Ilya Petrovich Tchaikovsky was appointed as the new head of Kamsko-Votkinsky district. Upon arrival from St. Petersburg in Votkinsk he along with his wife Alexandra Andreyevna settled in Gospodskaya street in spacious, comfortable house - state apartment of iron works mining department heads. 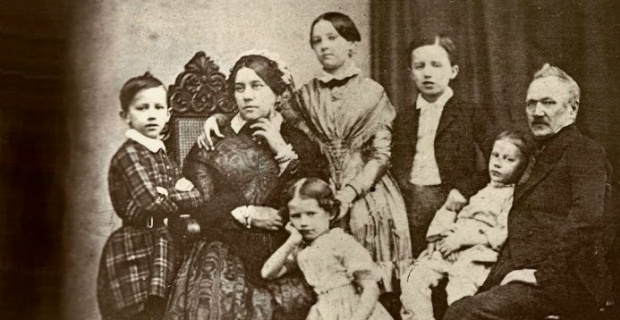 The Tchaikovsky family was characterized by rare atmosphere of love, an exceptional harmony and mutual respect. They spent 11 happy years in Votkinsk and four children were born there. May 7, 1840 Pyotr Tchaikovsky - the future genius of Russian music was born. State memorial architectural complex "Museum estate of P. I. Tchaikovsky" is a unique monument of history and culture of national importance. Admirers of Tchaikovsky come here from all over the world to plunge into the atmosphere of childhood of the Russian genius, to hear the sound of his children's piano and old orchestrina. April 30, 1940, on the eve of the 100th anniversary from the composer's birthday, the old mansion on the shore of the pond again became called the Tchaikovsky house and warmly welcomed its first visitors, as in the old days, when the friendly owners were living here. Two years earlier the Decree of the Council of people’s Commissars of UASSR approved the initiative of Votkinsk city council and a Commission responsible for holding the centenary of the birth of P. I. Tchaikovsky was established. The building, which from 1806 to 1938 belonged to the iron works, was transferred to the museum. The Tchaikovsky house was restored twice. During restoration in 1967-70 it received the appearance of 30-40-ies of XIX century, the interior of the apartment of mining department head was restored. 1990 became a turning point in the fate of Tchaikovsky house. 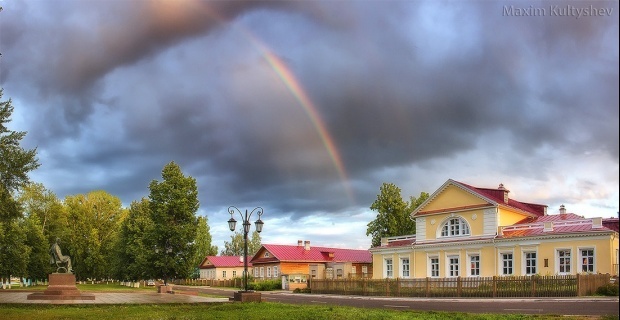 To celebrate the 150th anniversary since the birth of Pyotr Ilyich Tchaikovsky the original appearance of the "state mansion at the iron works" was completely restored. On the ancient foundations household outbuildings were built: a shed for carriages, stables, flocks, ice room, greenhouse, surrounded by fruit gardens, garden houses (16 expositional objects on the territory of more than 3 hectares). Also in 1990 opposite the Museum a monument to P.I. Tchaikovsky was installed, which has become one of the attractions of Votkinsk. (The author is a Moscow sculptor O.K. Komov). The main relics of the Museum are subjects belonging to the family of Tchaikovsky. 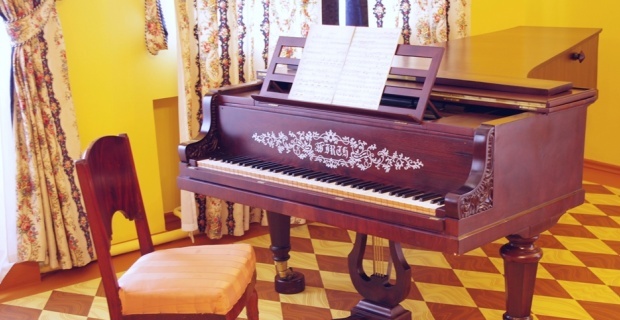 First of all – a children’s piano "Virt" touched by fingers of Peter Tchaikovsky when he was a child, fireplace screen, embroidered by the mother of the composer Alexandra Andreyevna, the table from Moscow apartment of P. I. Tchaikovsky. It should be noted that Votkinsk museum since its foundation has gained much more importance than just a historical monument, learning how to successfully combine two hypostases. On the one hand, it's really a memorial. 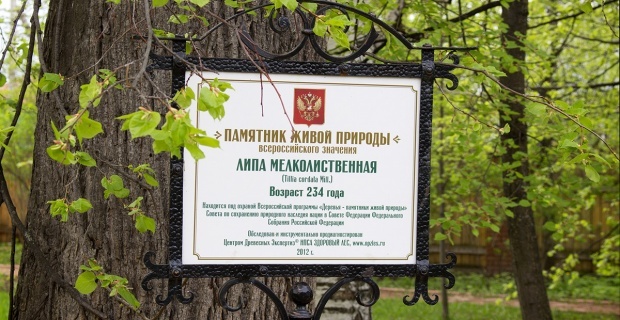 Funds of the memorial estate of P. I. Tchaikovsky store unique materials and priceless collections of exhibits. On the other hand it is also the place where guests are always welcome; they may attend a variety of exhibitions, unusual theatricalized tours, concerts. In preparation for celebration of the 175th anniversary from the birthday of P. I. Tchaikovsky's the restoration of museum complex has been started in memorial and architectural complex "Memorial estate of P. I. Tchaikovsky" since September 2013. March 30, 2015 the opening ceremony of the museum after restoration took place. And today the memorial estate of P. I. Tchaikovsky is a historic space with modern navigation systems and systems informing the visitors, a high level of safety, comfort and service. There is an area for people with disabilities created in the house and in the territory of estate. Art project of the exposition "Music inspired by the childhood" was developed by the Ural regional Institute of museum projects. The use of modern multimedia technologies (including a 16-metre 3D screen in the mezzanine of the house) gently fits into the canvas of the exposition without interfering with the overall perception of the atmosphere of the house. The house was filled with a variety of sound effects and musical illustrations. It is known that Pyotr Ilyich from his childhood loved music. But sometimes this love grew into a torment. One day after a musical evening with tears in his eyes he asked "to remove the music out of his head": "Oh, this music! Take it away! She haunts me!" That’s why music plays important role in new exhibition. The sounds coming from the rooms, voices, flowers, "things left" will create the feeling that the owners had just left the rooms of the house. Welcome to the family of Tchaikovsky – "the museum of happy memories"!!! BUDGETARY INSTITUTION OF CULTURE OF UDMURT REPUBLIC "STATE MEMORIAL ARCHITECTURAL COMPLEX"
"Memorial estate of P.I. Tchaikovsky"
© 2019 BUDGETARY INSTITUTION OF CULTURE OF UDMURT REPUBLIC "STATE MEMORIAL ARCHITECTURAL COMPLEX" "Memorial estate of P.I. Tchaikovsky"